A brush fire erupted at Camp Pendleton Friday amid searing temperatures, forcing evacuations of base facilities and housing complexes, but no injuries were reported. The fire broke out for unknown reasons around 11:30 a.m. in the Mainside area, according to the Marine Corps base, and had blackened about 330 acres as of early evening. Containment was estimated at 40 percent. Meanwhile, a wildfire blackened swaths of hilly open terrain in the northeastern reaches of Marine Corps Air Station Miramar. That blaze erupted for unknown reasons about 3 p.m., according to MCAS Miramar public affairs. By early evening, the fire had grown to 100 acres, but forward movement had been halted and it was 25 percent contained. 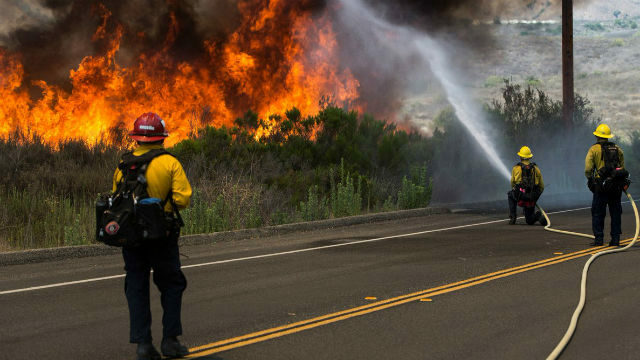 Crews with the San Diego Fire-Rescue Department were helping base firefighting crews extinguish the blaze, which was posing no structural threats. At Camp Pendleton, evacuations were ordered for Lake O’Neill Recreational Park, the Naval Criminal Investigative Service building, the O’Neill Heights housing community, DeLuz Family Housing and DeLuz Child Development Center. Evacuees were directed to the Paige Field House. About 750 homes had been evacuated as of 3 p.m.